“EUGONIA EPE” (hereinafter “EUGONIA”), a Greek company registered in Athens (7 K. Ventiri Str. ), represents the sole administrator of the domain name eugonia.com.gr and the website thereunder www.eugonia.com.gr (hereinafter “the Website”) and is deemed as the Data Controller of the personal data we collect and process when you visit our Website, namely of any and all information which could directly or indirectly identify you. Protecting the privacy of your personal data is very important to us, thus we have taken all appropriate measures in order to safeguard the security and confidentiality of the information related to visitors and/or users of our Website. We kindly ask you to read the present Policy carefully, so as to be properly informed of your data privacy rights, as well as the personal data collected and processed throughout your visit across our Website and the use of our corresponding internet services. Upon informed consent of the parents, we display anonymous baby photos of babies born with IVF methods performed by EUGONIA, as well as hand-written acknowledgements of our patients. The names and CVs of our staff are also available on our Website. 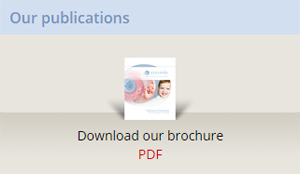 The Website also displays references to scholarly papers related to IVF. Kindly be informed that any processing of personal data prior to the revocation of consent is deemed lawful. You must refrain from visiting our Website, should you wish the information automatically collected therefrom, not to be collected and processed in any way. We use your personal data to communicate with you in relation to your request. In particular, we may process your personal data to respond to your queries and inform you of the medical services we provide in the field of gynecology and IVF, as well as to arrange an appointment with you upon request. In order to find out more about our Website’s user experience, we retain and analyze the data we collect in an aggregated form. For example, we may use this information in order to monitor and analyze the use and functionality of our Website, thus identifying its level of content engagement with the public, which in turn concludes the steps required towards securing its relevance with, and accessibility by, its visitors. EUGONIA respects your right to privacy and uses your personal data solely for the purposes described above. EUGONIA does not disclose, transfer of make your personal data accessible in any way to third parties, nor does it transfer your personal data outside the EEA. We may disclose aggregated information which do not directly identify you to third parties, in order to be able to develop the content and services of our Website. Please note that we do not in any way disclose your contact details to third parties. We may use third parties (currently or in the future), for the provision of services in relation to our Website, such as technical support thereof, collection of analytical data, marketing activities, mass mailing of newsletters etc. Those third parties will only access the information absolutely necessary for the execution of their duties and only under explicit contractual terms for the protection of your privacy and your personal data. We may disclose personal data to abide by Court orders, research warrants, judicial procedures and other orders of the competent Regulatory Authorities, including the Greek Data Protection Authority, other Supervisory Authorities of EU Member States and the Greek National Authority of Assisted Reproduction, as well as in order to defend our lawful interests from claims raised against us. EUGONIA will retain the personal data collected for the time absolutely necessary to serve the purposes of processing and to comply with its legal obligations, including the obligations for the retention of medical records, if applicable. In case you recall your consent to the collection and processing of your personal data, we will immediately delete your data from our electronical and physical records, unless its retention is necessary so as to comply with a legal obligation or to exercise, ground and defend our lawful rights and interests before the Court or any other Regulatory Authority. -SSL Protocol: The SSL (Secure Sockets Layer) Protocol used by our Website, is the current world standard for the certification of website users and the encryption of data between website users and web servers. An encrypted SSL communication protects personal data by requiring all information transferred between a customer and a server to be encrypted from the sender’s software and to be decrypted by the receiver’s software. In addition, all information sent through an SSL protocol is protected through a mechanism which automatically detects if the transferred data has been altered. -CAPTCHA: EUGONIA uses Google “I am not a robot-CAPTCHA”, which is an advanced technology for the prevention of malware trying to penetrate access to your emails and other personal data you submit through our website communication form. CAPTCHA protects the originality and safety of your personal data and prevents the malicious use of valid email addresses for spam communications or other unlawful and unsolicited actions. Right of access, so as to be informed of the personal data we process, the purpose of processing and the recipient of data. Right to rectification, for the correction of any inaccurate information about you. Right to erasure (right to be forgotten), so as to ensure the erasure of your personal data from our files, so long as its processing is no longer necessary or obligatory for the compliance with a legal obligation of the Company or the defense of a lawful interest before the Court. Right to restriction of processing, in case the accuracy of your personal data is disputed. Right to data portability, so as to receive your personal data in a structured, commonly used and machine-readable format. Right to object, if you no longer wish your personal data to be processed for direct marketing purposes. Please note that your personal data is not subject to profiling by EUGONIA nor is it used for any marketing purpose whatsoever. Eugonia will make all reasonable efforts to address your request within the period of one month from receipt of the request. However, in case it is impossible to meet this deadline due to the complexity of your request or the number of simultaneous requests, Eugonia will timely inform you within same deadline for the reasons of the delay and will make all reasonable efforts to address your request without undue delay and, in any case, within a period of two more months. Eugonia reserves the right not to satisfy your request, if manifestly unfounded or excessive, and will notify you accordingly. Nevertheless, you have the right to file a complaint before the Data Protection Authority (www.dpa.gr). Cookies are then sent back to the originating website on each subsequent visit, or to another website that recognizes that cookie. Cookies perform lots of different and useful operations, such as remembering your historical preferences, generally improving your online experience, and helping us to offer you the best product and services. Necessary Cookies. These cookies do not identify you as an individual. These cookies are essential to make our Website work correctly, they enable you to move around our Website and use our features. Performance Cookies. These cookies do not identify you as an individual. These cookies collect information about how you use our websites, for instance which pages you go to most often, the time spent on our websites, and any issues encountered, such as error messages. Functionality Cookies. The information these cookies collect may include personal data that you have disclosed. These cookies allow our website to remember the choices you to provide a more personalized online experience. You can use our cookie management tool to disable cookies. Most internet browsers are initially set up to automatically accept cookies. If you do not want our website to store cookies on your device, you can change your browser settings so that you receive a warning before certain cookies are stored. You can also adjust your settings so that your browser refuses most of our cookies or only certain cookies from third parties. You can also withdraw your consent to cookies by deleting the cookies that have already been stored. If you disable the cookies that we use, this may impact your experience while on the Website, for example you may not be able to visit certain areas of a website or you may not receive personalized information when you visit a website. EUGONIA reserves the right to freely modify the present Policy, in accordance with the provisions of data privacy laws anytime in force. The Visitors of our Website must frequently read the present Policy, so as to be informed of any change, whereas EUGONIA shall provide all necessary notices to its users, in order to comply with the provisions of the General Data Protection Regulation (EU) 679/2016.